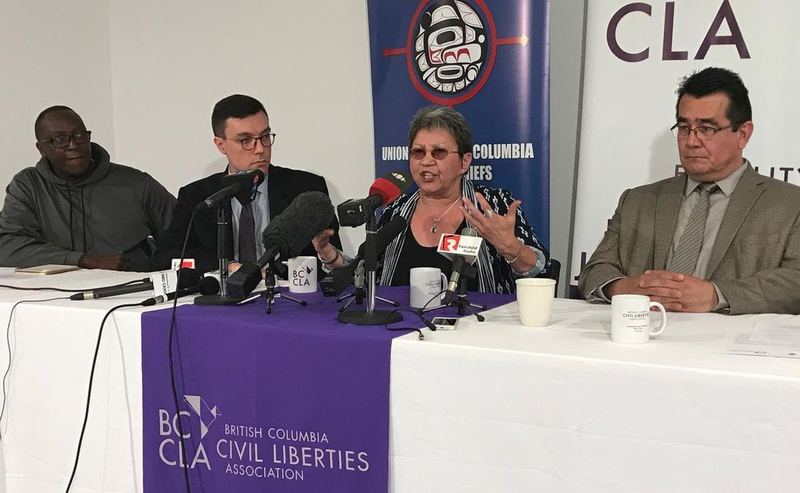 The British Columbia Civil Liberties Association (BCCLA) and British Columbia Union of Indian Chiefs (UBCIC) filed a complaint to the Vancouver Police Department (VPD) Chief and brought to public attention what racialized communities have been saying for years: police unfairly target Black and Indigenous people for street checks, or carding, which refers to stopping individuals to gather information without reasonable suspicion of an offence. Carnegie African Descent Group and Power of Women representatives spoke at the press conference panel to put into perspective how frequent police street checks are an infringement on people’s basic human rights. In Ontario, where the Black population is significantly higher, the issue of carding has drawn a lot of media attention. Under pressure of protest and complaints that police were disproportionately targeting minorities, the Ontario provincial government finally issued regulations restricting street checks in the spring. Although the police claim that they serve and protect the public, Indigenous and racialized people often feel that, in fact, the police do not serve or protect them. Black and Indigenous people are taught that the primary role of police is to protect property. They learn this lesson when they enter department stores and are immediately seen as criminals, followed closely by security officers, and made to feel uncomfortable and unwelcome. The same lesson is reiterated when police pull you over for “driving while black,” making you aware that a sudden movement or a wrong word could end your life. Based on a Freedom of Information request, the VPD released data on the number of street checks conducted between 2008 and 2017. Over that period, the VPD conducted 97,281 street checks. Between 2008 and 2017, approximately 4% (4,365) of all street checks were of Black people, despite this population making up less than 1% of the population of Vancouver over that time period. In 2017, Black people accounted for 5% of all checks (315), despite making up only 1% of the population. The other group that faces disproportionate police harassment is Indigenous people. Approximately 15% of all street checks (14,536) were of Indigenous people, despite this population making up approximately 2% of the population of Vancouver. Compared to Ontario, we have limited information on carding in British Columbia. The Vancouver Police Department is the only municipal police that has released its statistics on street checks in British Columbia. The BCCLA has requested other municipalities to do the same. Can the issue of carding be addressed through regulation? Some community rights activists argue that the practice of carding should be limited to public safety investigations. They advocate for laws that would require police officers to articulate how the contact information they collect through street checks serves a public safety purpose and to advise individuals of their right to refuse to cooperate. Law reforms such as this could prevent discrimination by requiring the police to provide training and track compliance. This perspective is not shared by those who work in law enforcement. Their views are diametrically opposed to the views of the community. What community members, lawyers, academics, journalists, judges, and others see as harassment, intimidation and racial profiling, the police see as essential to their exercise of arbitrary power over racialized and colonized communities.